Spend a Little, Save a Lot: Yearly Mower Maintenance Keeps Your Mower Running Longer! Gasoline mowers can present some unwelcome repairs from time-to-time, but if you perform some simple yearly maintenance you can extend the life of your mower and prevent costly repairs. In this article, we key in on 3 steps that one should perform annually to make sure that their mower is starting quickly and running smoothly! 1. Change Air Filter - This is an easy step, but an important one! A clean air filter ensures that the air being used in the engine combustion process is clean and free of dirt. There have been many different types of filters made over the years, including foam filters and pleated paper filters. Once you have found your correct replacement, replacing the air filter generally requires no tools! Open the air filter compartment, remove the old, clean out any other debris in the compartment, and then replace with the new filter. That's it, you are done with this step! 2. Change Spark Plug - Replacing your spark plug each season helps to ensure that the mower will start easily and run smoothly. The spark plug is generally located at the front of the mower and has a spark plug "boot" (either metal or rubber) that needs to be removed to access the spark plug. Simply pull the boot away from the plug and unscrew the spark plug with a deep-socket wrench. There will be a part number on the plug that will help you locate the proper replacement. If the plug is an exact match for your model, there should be no adjustments that need made. Simply install the new and you are ready to go. 3. Change Engine Oil - Most mowers made in the past 10 years are what is considered 4-cycle engines. These engines run on regular gas and straight engine oil (no mixing required). By replacing the oil each year, you rid the engine of dirt and contaminants that have collected over the course of the prior season! To replace the oil, you generally have to tip the mower to allow the oil to pour out of the spout. Then replace with the proper amount of small engine oil for your mower (check the owner's manual if you have any questions on which type to use). In addition to these 3 steps, we would also recommend that you look over the mower and be sure that there are no broken or missing parts, such as wheels, baffles, pull cords, etc. 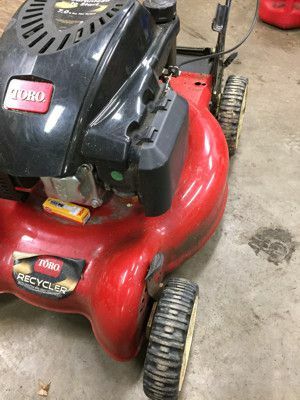 Also, mower blades often need resharpened every 1-2 years, so monitor your mower's performance and if you start to notices grass tips being shred when cut... then it is time to replace or resharpen your mower blade. By spending a little bit of time to maintenance your mower each season, you can save a lot by avoiding costly repair bills.